This week, before leaving, we spend time at a cottage with Tara’s family. For three weeks before that, we live with mine. If you really want to appreciate a five-day car ride across the country with the person you love, live with your parents for a while first. I love our families, but I think there's a reason we leave home eventually, and that it’s best sometimes to love them from afar. And after this move, that’s all I’ll have. 1. Amazing Adventures #31 – “The Day the Monuments Shattered” from “Bearly Used Books” in Parry Sound, Ontario. I had a good feeling about Parry Sound, that I’d be able to start my collecting here. There must be a used book shop in Parry Sound, and used book shops have weird old comics. You can never knock the weird old comics you’ll find at used book shops. 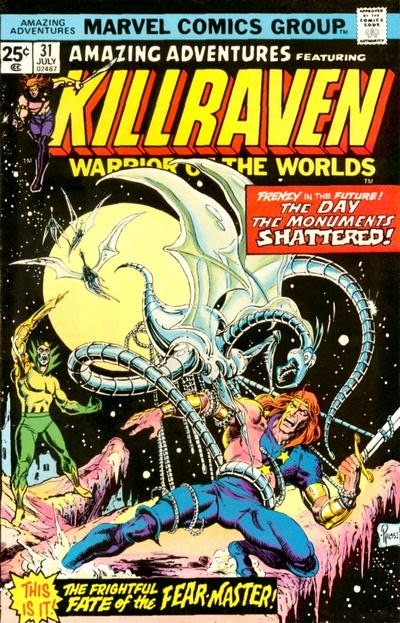 Killraven is the leader of a small pack of rebels on a future, war-torn Earth where the Martians from Wells’ War of the Worlds decided to come back in force. Yep. It’s a sequel to Wells. There were more comics here, but I just got the one. I just want one, to keep me in the place where I got it. To always remember the trip, because I knew it was going to be amazing. And guess what? 2. 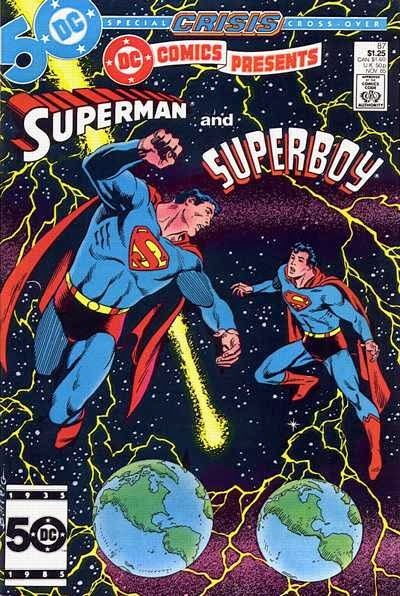 DC Comics Presents #87 – “Year of the Comet” & “The Origin of Superboy-Prime!” from “The Rad Zone” in Sault Ste. Marie, Ontario. In Nipigon, the lady at the thrift store directs us down to the end of the street to talk to Tom Herbert, who apparently has a huge comic collection. We drive to Tom’s store, and there he is, just as described, sitting in the front window of “Herbert’s Confectionary.” Inside the lights are all off, and Tom sits in the sunshine in the front window, watching television. He is old, white hair spilling from beneath his baseball cap that matches the beard that covers his chest. We explain our purpose, that I am seeking comics, and he stares at us blankly. It turns out that he does indeed have a huge collection of about 13000 books, but that they are not something that he sells. He is giving them to his grand-daughter, he tells us. Tom then proceeds to try to convince me that I should really be collecting and selling “Hot Wheels” cars. We listen for a while, then politely excuse ourselves, and get back on the road. “The Rad Zone” is a comic-record-movie-skateboard-head shop-looking kind of place. It’s very rare that I’ll pass up a Superman-based comic if the price is right. And it is. Last time I was in Sault Ste. Marie, the same thing happened. Not sure what to make of that. 3. DC Comics Presents Annual #1 – “The Last Secret Identity!” & The Marvel Tarot from “Comix Plus” in Thunder Bay, Ontario. In Thunder Bay, I finally find a real comic store. “Comix Plus” is a bit dingy, has uneven wooden floors, walls lined with old action figures, and is in the midst of a 50% off back issues sale. The sale is the only reason that the store is still open when we arrive an hour and a half after usual closing time. To show deference to the serendipitous occurrence, I buy 2 comics. 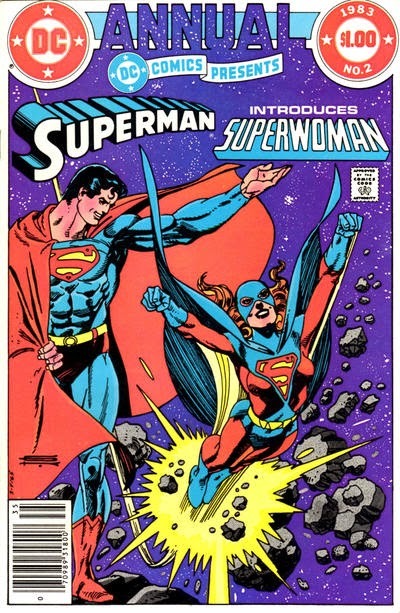 The first is a DC Comics Presents annual, featuring the first appearance of the pre-Crisis Superwoman. I’m sensing a trend. 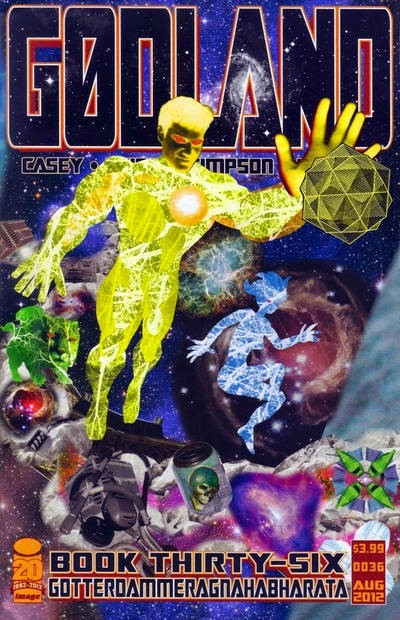 The second, to thank the confluence of events that brought us to “Comix Plus,” is called The Marvel Tarot, and is a made-up grimoire detailing magical correspondences in the Marvel universe. I keep forgetting that we’re not going back, that I won’t be telling my friends about this adventure on our usual Tuesday night gathering. I suppose that’s why I’m writing this. I wonder why so many Supermen go bad? Marvel’s Sentry, DC’s Superboy-Prime, the Plutonian from Irredeemable, and Eric Larsen’s recent Supreme. What makes the paragon of good so useful for evil? 4. 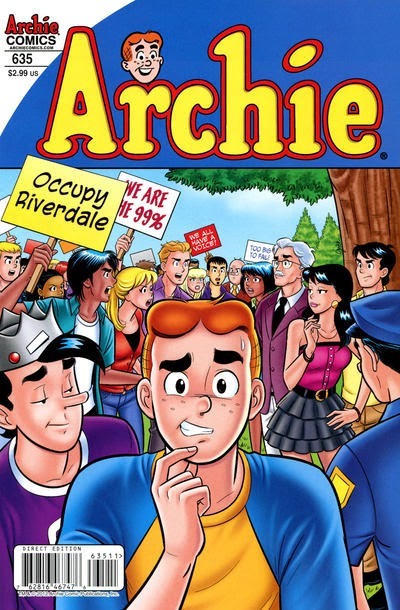 Archie #635 – “Occupy Riverdale” from “Walmart” in Kenora, Ontario. Kenora’s dearth of comic or used book shops is redeemed, bizarrely, by Walmart, whose selection is not great, but is at least comics. To Tara’s surprise, I pick Archie over some of the Batman titles, as the issue deals with the effects of the Occupy movement on Riverdale. Recently, Archie comics are starting to impress me. They were some of my earliest comics. Am I finding my way back to them? I find no comics in Manitoba. In desperation, at a gas station in the middle of the prairies, I plunk a loonie into one of those vending machines that they have in men’s washrooms, and come away with a tiny little book entitled Exotic Sexual Artistry, an instruction manual of sorts in disappointingly tame sexual positions from around the world. But it has sequential words and pictures, so it counts. 5. 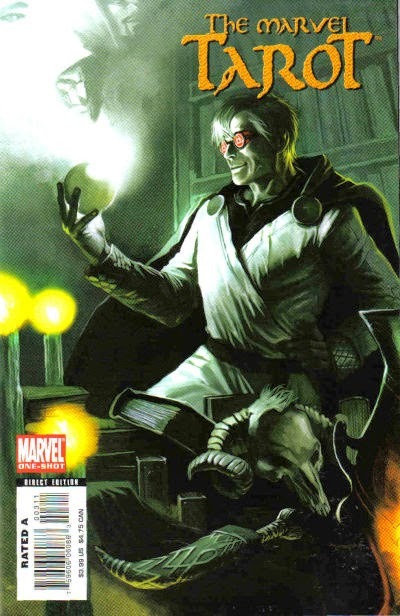 G0DLAND #36 – “Gotterdammerangnahabharata” & National Comics: Eternity #1 from “Comic Readers” in Regina, Saskatchewan. As for National Comics...you know, I have no memory of it whatsoever. 6. 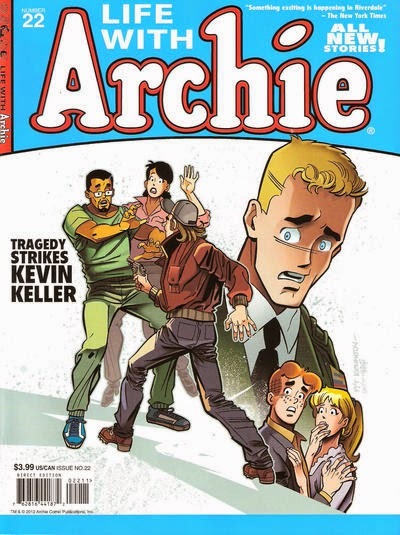 Life With Archie Magazine #22 – “Just Like Starting Over part 4: Suddenly! & “Saturday!” from “Petro Canada” in Swift Current, Saskatchewan. Had I bought a comic at every gas station, this would be a much longer story, but the first time I ever see a Life With Archie magazine is here. I’d bought and read the Archie wedding issues. They were cute and very true to the spirit of the characters. These were strange and fascinating, and like the comic from the Walmart in Kenora, found in an unexpected place. 7. 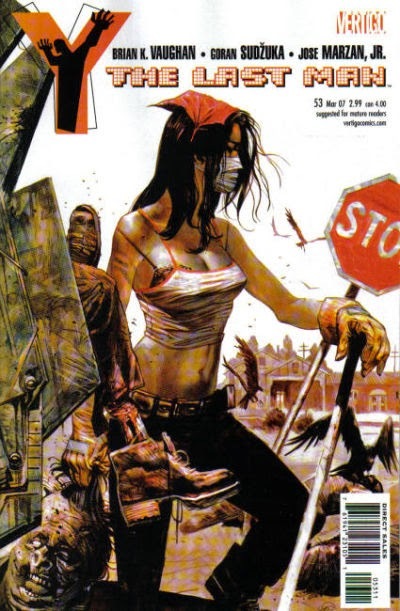 Y: The Last Man #53 – “” from “ComicReaders” in Medicine Hat, Alberta. Last one for the road. When we arrive in Medicine Hat, I realize that it’s my last chance to buy a comic on our trip before our trip ends, so I google comic stores. We find one and head out. Another comic in its closing phases. Or past them, closed, actually. I just lost track of it when it was being published, and I’ve never been able to get my hands on the final issues. The collector makes ended things continue, somehow. We’re hungry and decide to hit the pub across the road for food. As we walk up, it is the first time we see the “No Minors Allowed” sign, and it sinks in that we are indeed in a strange, new world.